Families wake up and eat breakfast together at the kitchen counter. Someone runs to the street corner and buys a nice hot baguette from the bakery and brings it back home. Parents fix coffee-milk (1/2 coffee / 1/2 milk) and children fix hot cocoa and they all prepare their hot drinks in a bowl! In France you don’t cut a baguette, you tear it. And so, everyone tears off a big chunk of bread spreads it with real butter and dunks it into their hot drink (that’s why it has to be in a bowl). 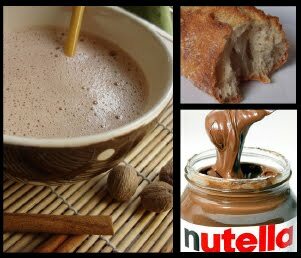 Most kids like to spread Nutella, a chocolate-hazelnut spread, on their bread. Children walk to school. It’s fun for neighbors to run to each other’s house’s and ring the doorbell summoning their friends. Then they walk together laughing and talking. Children have an hour and a half for lunch break. They don’t really want to get stuck at school that whole time so if their parents don’t work too far away they come home and fix a nice hot meal for the family. (Parents get a two hour lunch break). Otherwise the kids eat at the school cafeteria. Goûter means snack. This is the third meal of the day, and it is just as important as the other three. 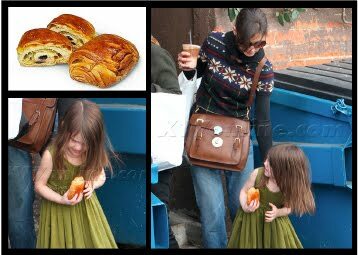 On their way home from school children stop at the bakery and get a Pain Au Chocolat, a bit of croissant dough rolled around a chocolate bar and baked crispy and golden. This tradition helps the kids transition between work and play and end the school day well. Dinner at home with the family. French kids drink water and only water with their well-balanced meals. They can choose to drink sparkling water if they like. French are famous for beef stews, green beans, and yes, they LOVE French fries!